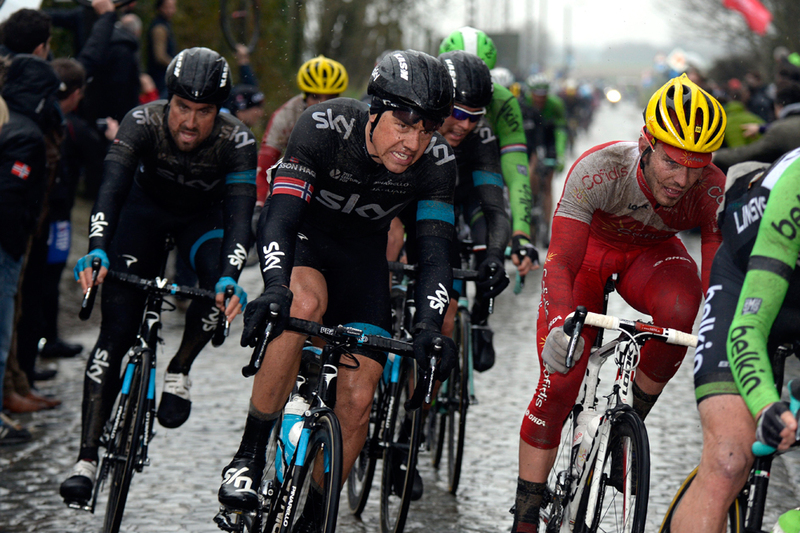 The Briton shows that Team Sky's riders can be racers and not just robots after all. The charge levelled at Team Sky’s riders about their unsuccessful Classics campaign last year (and seemingly when they don’t win any race) is that they are robots not racers. It’s said that as able as they are to ride tempo day after day in Grand Tours, they lacked the instinct and tactical nous needed to deal with the vagaries of one-day racing. And although Ian Stannard’s win today was not in a monument, and nor did it come against the likes of Fabian Cancellara and Peter Sagan, it showed that maybe Sky can win when relying on tenacity, and not just technology, after all. Just like their one-day approach for 2014, Sky’s riders kept a fairly low-key profile for the first two hours of the race. Omega Pharma-Quick and Belkin initially marshalled the day’s early breakaway, with Bernie Eisel’s appearance at the front of the peloton on the Haaghoek cobble section 90 kilometres from Ghent the first time the black and blue kit was truly visible. That the break only contained bit-part players is largely irrelevant, although handily once the eight-man started to split and the big names became more active, never did the it swell to a size that would have been tricky for the peloton to catch. After Tom Boonen failed to deliver his customary attack on the Taaienberg, his Omega Pharma team-mate Niki Terpstra broke clear on the Eikenberg, and was followed by Yohan Le Bon (FDJ.fr) and Dries Devenyns (Giant-Shimano). They soon caught five of the remaining eight leaders, but attempting to ride what was essentially a three-up to the finish some 55 kilometres away was too ambitious. The race was soon back together again. Edvald Boasson Hagen’s race craft has come under scrutiny arguably more than that of any Sky rider. A natural talent he may be, but given his much-publicised unfamiliarity with the sport’s past, and its nuances, has arguably hindered his career trajectory. Yet when Greg Van Avermaet (BMC) attacked on the Leberg, a short and relatively easy climb in comparison to others in the race, he followed Terpstra, Kenneth Vanbilsen (TSV), Arnaud Demare, Yoann Offredo (FDJ.fr), Lars Boom (Belkin) and Egoitz Garcia (Cof). He was right too: this group may not have had big stars in it, but it had the legs. Offredo fell going on the slippery right hand turn onto the Molenberg while in second wheel (which somehow everybody else avoided), before Terpstra and Boom eventually broke away over the top. Boasson Hagen took three kilometres to join them and given that he is the fastest sprinter of the trio, when he did catch them he was not forthcoming with help. Boom once had to wave the Norwegian through, and after he had cruelly punctured, Terpstra’s attempts to bargain with the Sky rider were replied to with a shrug of the shoulders. They both tried (unsuccessfully) to break away solo, before Boasson Hagen delivered his longest turn on the front – just when the chasers were about to rejoin them. For all their supposed strength, and formation pacesetting in the early stages it was notable that Omega Pharma never placed more than one man in a move. The numbers game is also important when it comes to Team Sky: last year, they unwisely sought to win one-day races by relying on their squad strength. Today, however, it was clear that they’re now basing strategy around one or two leaders. Stannard had been particularly quiet up to this point, save for when he marked a move from Belkin’s Sep Vanmarcke and Maarten Wynants on the Taaienberg. Yet no sooner than Boasson Hagen and Terpstra had been caught 16.8 kilometres from the line, he launched a textbook counter attack. 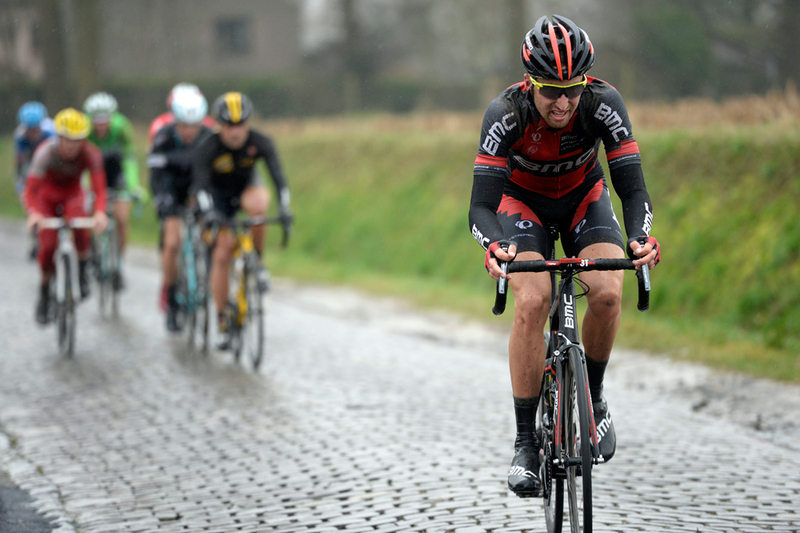 Greg Van Avermaet (BMC) followed, and together they worked well, taking turns of around 500 to 700 metres in length. A gap of 10 seconds was quickly gained. Vanmarcke attempted to get across, capping a performance in which he missed the key moves and attempted the wrong ones (he was the first of the favourites to attack, keenly making a short-lived move on the Taaienberg). Terpstra and – crucially – Boasson Hagen went with him, essentially deeming the leaders versus the chasers a two-versus-two duel. The gap fluctuated between eight and 15 seconds and, annoyed the race was slipping away, Terpstra again got annoyed with Boasson Hagen for his refusal to work. There were no such issues upfront, although Stannard cleverly removed his sunglasses with 3.7 kilometres to go, forcing Van Avermaet to come through again not long after he had done a 800m turn. The duo matched each other at the front until the flamme rouge, which the Briton led under, but stuck close to the pavement as the finish neared. So when the Belgian accelerated with around 700 metres remaining, Stannard could respond, but he sensibly played the waiting game. He thereby got the perfect slipstream from which to start his sprint. This came with 300 metres to go, immediately after Van Avermaet had faced forward again after looking back at his rival. Another smart move from the Essex-born rider. It was a long sprint, nearly too long in fact, as the gap closed significantly on approach to the line, but it capped an impressive tactical performance by the Briton. Who says Sky cannot win one-day events?